Often men want something a little bit different without going too far. We are equally passionate about understanding mens taste, we love to make those different pieces just for him. Lately we’ve been exploring designs with a strong interest in materials like Rose gold, Princess cut diamonds, square step cut diamonds, baguette diamonds, Black diamonds, Black spinel and strong, bold Platinum. 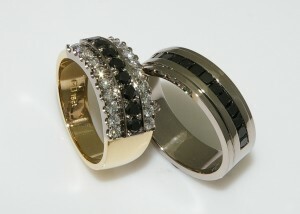 Simple fine detail is often the key for mens wedding rings. We love it when we tie in a design feature for him and her.